Andrews McMeel Publishing, 9781449465032, 256pp. The Dairy Good Cookbook is a celebration of the world of the 47,000 dairy farm families and their contributions to American life. The 115 recipes showcase the taste of dairy in many forms, from cheese to yogurt, milk, and butter. The book gives a unique perspective through recipes and photographs of a day in the life of dairy farms, cows, and the farmers who bring us our dairy. Dairy farming is one of the hardest types of farming there is, and these farmers take a tremendous sense of pride in their work. Ninety-five percent of the 49,000 dairy farms in America are family owned, and many families have continued to own their farms for generations. Milk is in their blood. The Dairy Good Cookbook showcases the lives of these hard-working farmers across the country. This book celebrates not only the love that people have for dairy foods, but it also pays tribute to the dairy farmers—and even the cows that make all this great cuisine possible. The book is divided into six sections organized by a day in the life of a dairy farmer, beginning with Sunrise and ending at Sundown, along with other special days in the year (including holidays and family get-togethers). Each chapter highlights one of six different types of dairy cows and includes profiles of both large and small dairy producers. Nothing soothes the soul quite like a warm bit of Macaroni & Cheese, Apple Cheddar Pizza, Apricot Dijon Pork Chops, or a taste of Dairyman’s Chocolate Cake. The 115 recipes include dishes from the archives of Dairy Management, Inc. as well as family favorites from farmers themselves. Tips on cooking with dairy are included along with family-friendly recipes and myriad photographs of the food and farms. Unlike other foods that we consume, where our milk originates is probably less than 100 miles from our homes. Dairy is still a small, community-based business, and dairy farmers are the original environmentalists since their livelihood depends on the health and well-being of their animals and where they live. 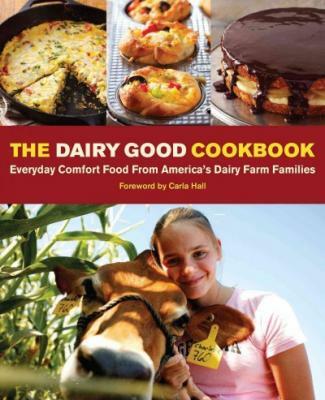 This cookbook has the endorsement and support of Dairy Management, Inc., the umbrella organization to which all of America’s dairy farmers belong. Carla Hall from The Chew has contributed the foreword, and it will be released in early June for National Dairy Month.